The novel three-minute snippet series,”Thattu Kada” , on mouth-watering specialty Fastfood Eateries across the country has been an instant hit on Amrita TV. Fanning out in all districts of Kerala as well as ,Delhi ,Chennai ,Bangalore ,Mumbai, Hyderabad,UP, Bihar, Chattisgarh,Uttarakhand , Gujarat and Assam, Amrita TV News Reporters have discovered and highlighted unknown food joints which dish out culinary delights at affordable prices. In a country, where a vast multitude desires for a tasty snack or a quick lunch or a specialty refreshment which is easy on the wallet, “Thattu Kada” has served as a Video Guide to viewers of Amrita TV. 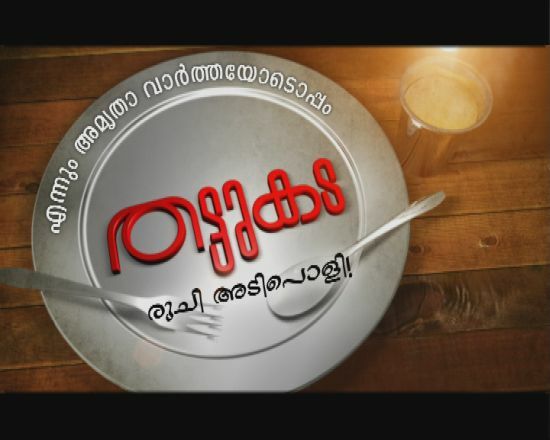 Over 500 eateries have been aired on Amrita TV with a new joint being featured every day of the week.In an era where eating out has become a burden,the popularity of Amrita TV “Thattu Kada” is a testimony of the common man’s preference for food which is cooked in front of one’s own eyes, served piping hot without any cosmetic frills,and at a value-for-money tariff. I hail from Thidanad, 4 KMs from Erattupetta (Kottayam) on Erattupetta-Kanjirappally route. Just opposite to theThidanad Panchayath Office, Hotel named TSV Hotel is functioni g since 10 years where only Lunch is served. One of the best food serving place in Kottayam district, The proprioter is Mr Jose. Neatly prepared food with top quality spices served in homely atmosphere.Please send ur reporters to get the facts reached upto the viewers.